The Founder's Room on the second level offers an excellent view of all activities taking place below and can accommodate banquets, meetings and special receptions. The balcony off the Founder's Room also offers scenic views of the main exhibition space, and is ideal for recording shows. A large conference room is located away from the exhibition halls on the second floor, as well. The Service Center, located East of the Purina Event Center, features an exam room, meeting space, showering facilities, dog bathing tubs and off-leash canine exercise areas. For more information on Purina Farms property and facility rental, contact Kaite Flamm, Senior Manager of Programming at 314-982-3232 or email her at [email protected] Aside from dog and cat shows, the Purina Event Center also hosts other pet-related events. Commercial rates are available on request. Diving Dog Titling Event, Open Swim, Practice Sessions, etc. Tents ranging in size from 10' x 10' to 40' x 80' are available on-site and can be used for shows, judging, grooming, food service and many other tasks. Other support equipment available includes flagging, portable sound systems, tables, chairs, fans, ring gating and signs. Portable toilet facilities can be brought to the site (at host club's expense). The facility is perfect. Each and every Purina staff member was extremely helpful and friendly! Many exhibitors and 3 of the 4 judges (from California and Virginia) were at Purina for the first time. Everyone was very impressed at our first class facility! Thank you to the entire staff at Purina Farms for the great care you gave us! I can't say enough good stuff about both your facility and staff ... TOP NOTCH!! Disney World for Dogs!! That is what one of our exhibitors said about Purina Farms. It's a wonderful place for dogs, dog shows and dog people because it is FOCUSED on dogs. The staff is well trained and very hospitable and helpful. 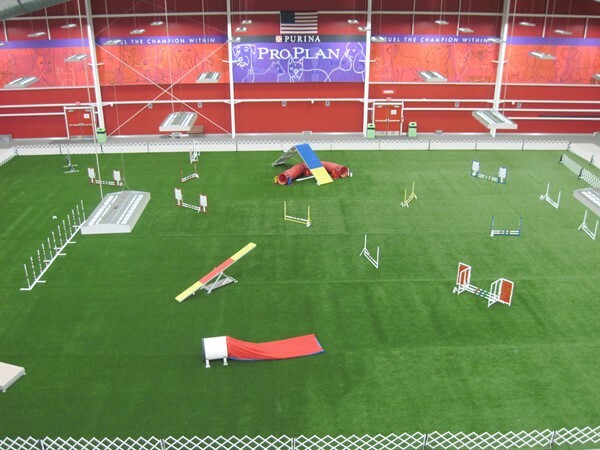 The equipment is all there and set up when you arrive, and the facility itself is “state of the art” for dog shows and show sponsoring clubs. I received rave reviews from so many people in our club who were visiting Purina for the first time. One of the nicest aspects of the facility is that it has everything and the price is all inclusive. There are no “hidden” or unanticipated costs, so budgeting an event there is much simpler. I can, without reservation, recommend it highly.